Standing Stone Honey Bee Products: What is Bee Pollen? Bee pollen is the flower pollen that honey bees forage from various flowers while they collect nectar and pollinate plants. The pollen sticks to their legs and they brush it with brushes they are equipped with into little baskets connected to their legs. It is the only food the honey bee harvests to eat other than honey. It is fed primarily to the developing bee brood. It is also called "bee bread." People use it as a food supplement. It is used because of the many nutrients it contains. It is one of the riches sources of a wide spectrum of nutrients from an all natural product. It is very high in protein content ranging between around 20-40 percent depending on the floral source. It contains a wide array of vitamin complexes and trace minerals. This includes B-complex vitamins (which are used to combat fatigue), Nicotinic Acid (used for detoxifying as it helps in the formation of blood) and Trocopherol (natural vitamin E, which is used to help circulation). People use it to alleviate allergies. 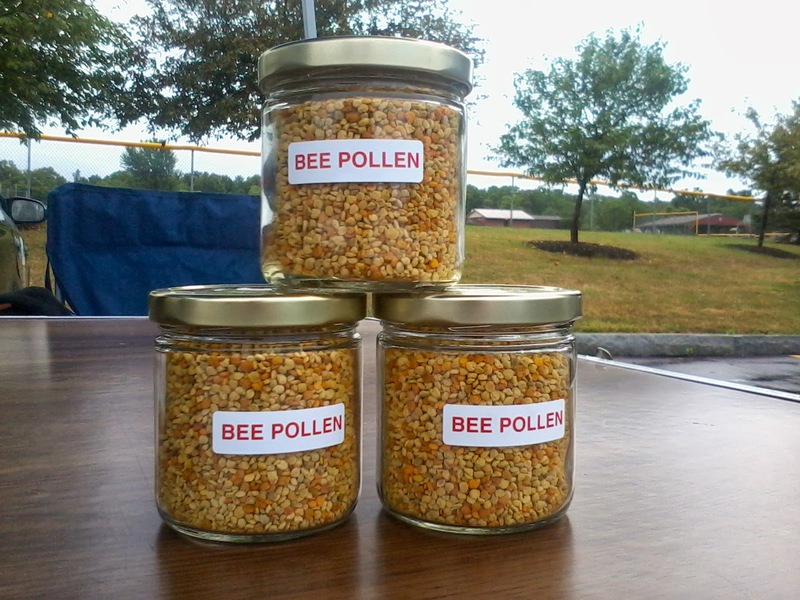 What's different about this bee pollen? Like honey bee pollen is going to be different throughout the season as the bees find different flowers to gather from. In just one day I've seen a huge difference in the color of the pollen the bees brought in because they were finding another flower that was in bloom. This also changes what proportions certain vitamins and minerals the pollen will have. The pollen I offer is what comes from the wildflowers and various herbs that grow in the countryside in the Fingerlakes Region of NY. I believe the best form of bee pollen to take is the granule type Standing Stone Honey Products offers rather the powder or pill form. With the granule form you know what you're getting and can tell that it is real as it is in the form the bees brought to the hive. Many pollens offer in the general stores are not anything local or even domestic, but are often from other countries like China. You can take it be the teaspoon or add it to other like salads, cereal, yogurt, or smoothies. It would be prudent to take a very small amount at first to make sure you are not allergic to it. It is recommended to take up to two teaspoons a day. Some people (including myself) take more. The taste is what I'd describe as bitter sweet and somewhat reminiscent to a chewable vitamin. It would be best to not pt it into other foods until after they are cooked because one of the great benefits associated with bee pollen are the good enzymes it provides.